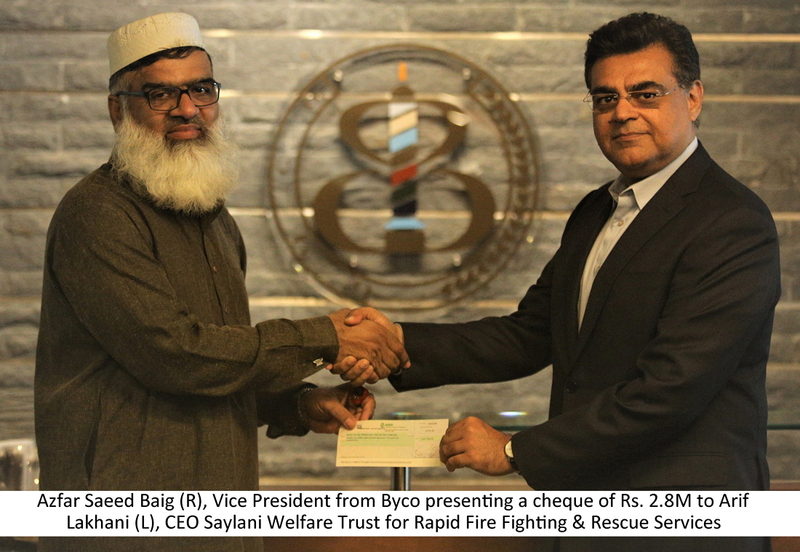 Karachi: Byco Petroleum Pakistan Ltd. has donated Rs. 2.8 million to the well-reputed humanitarian organization, the Saylani Welfare Trust, for the deployment of its Rapid Fire-fighting and Rescue Services along the motorway from Karachi to Peshawar in collaboration with the Motorway police. The donation under Byco’s corporate social responsibility strategy, seeks to proactively empower the Saylani teams to be prepared in advance to meet any emergency that may be a threat to life and property. For this 24-hour ready-to-rescue service, Saylani’s trained firefighters and rescue workers will use motorcycles to facilitate their reaching the incident places rapidly, and without any delays caused by traffic congestion or any hindrances on the road. Each motorcycle will be deployed with fire-extinguishing equipment and chemical powder, comprising of potassium bicarbonate (KHCO3), liquid water, and an evaporating fluorocarbon, that can be effectively utilized in containing fire.